"Breaded chicken wings that consist of bread crumbs, Parmesan cheese, garlic powder, melted butter, and a cookie sheet." Preheat oven to 400 degrees F (200 degrees C). Line a baking sheet with aluminum foil and generously spray with cooking spray. Mix Parmesan cheese, bread crumbs, garlic powder, onion powder, black pepper, and salt in a bowl. 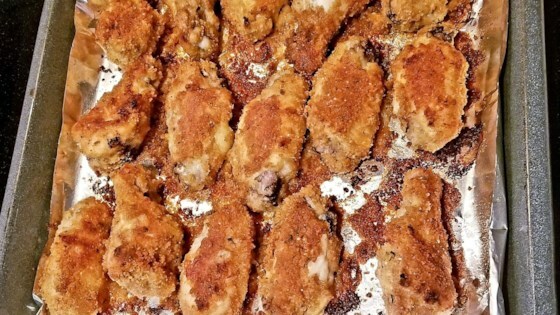 Dip chicken wings in melted butter; press into bread crumb mixture until well-coated. Arrange wings on prepared baking dish. Bake in preheated oven until golden brown, about 20 minutes. Flip chicken wings and continue baking until evenly browned and no longer pink in the center, about 10 minutes more. Impressively yummy, even without the bread crumbs (eating gluten free and low-carb because of Celiac Disease and type 1 Diabetes). Definitely will be repeating this! this was great! my picky kids loved it! I saw no reason to dip these in butter and add to the fat content. Instead, I dipped them in fat-free Ranch dressing. I left the rest of the recipe as written. Best chicken we've had! Another keeper. Only thing I did different was to add chili pepper to give it some kick!